$10/person Click on the link for more information and to purchase tickets. Join us at Pub Night for live music, drinks with friends, dinner from Our Kitchen food truck, and games in our cozy Cornish pub! Enjoy dinner from a local food truck while you grab a beer, root beer or glass of wine! The first drink is $10 with $5 refills. The unique Pendarvis House shield glass is yours to keep! 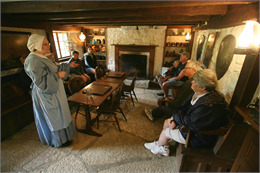 Proceeds from Pub Night go to preserving and interpreting the beautiful buildings at Pendarvis Historic Site.